For lodging near Central Pennsylvania Youth Ballet in Carlisle, PA, consider the Rose room at Carlisle House Bed and Breakfast. Featuring one queen and one twin bed, large private bathroom and soaking tub with jetted shower, this accommodation is particularly well appointed for parents or friends visiting the CPYB or our local colleges. Double Occupancy rates for this room vary from $159 to $229, according to the season. An additional guest can be accommodated at $25 to $35, also according to the season. If you prefer not to book online, please call us at 717-249-0350 or email us at Info@TheCarlisleHouse.com. The spacious front bedroom on the 2nd floor features a queen bed and a twin bed. A sitting area with two easy chairs provides a comfortable place for reading, conversation, or watching TV or DVD or Blu-Ray movie. 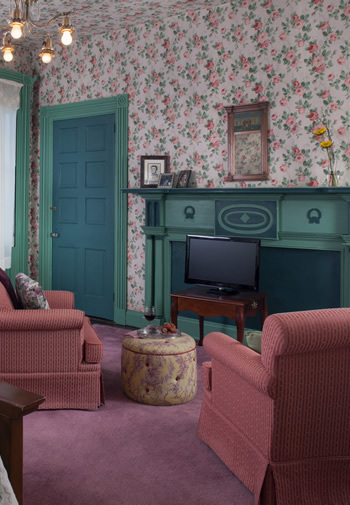 Once the bedroom of the Ewing twins, whose family arrived in Carlisle in 1849, it was papered with the present rose design in the 1930s when the boys were in grade school. The wide plank yellow pine floorboards highlight the scrollwork on the queen bed. A unique feature are the original pocket-shutters, which fold back into the window frame. A work table area with wired and wireless connection makes this large and friendly room ideal for the business traveler. 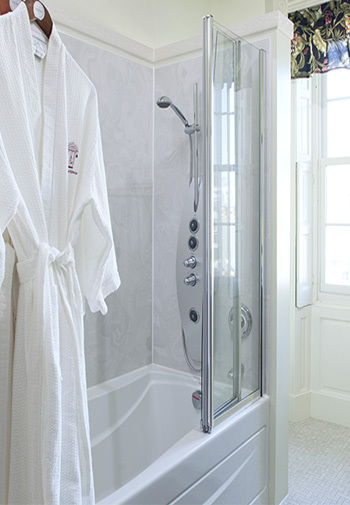 The bathroom includes a 5ft soaking tub, with a Grohe Aquatower multi-jetted shower unit and a marble topped double vanity.